Rachel Fee – Projects and demos from London Ontario-based back-end developer Rachel Fee. Projects and demos from London Ontario-based back-end developer Rachel Fee. 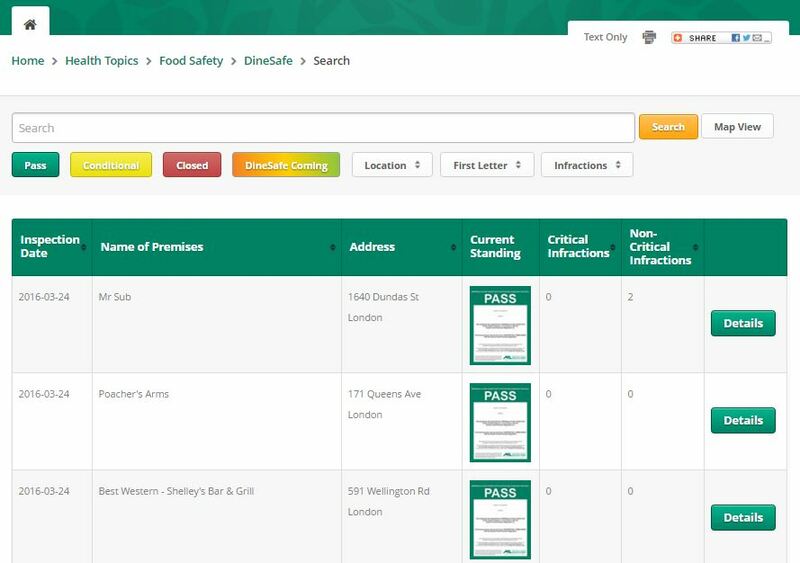 DineSafe is a web application created for the Middlesex-London Health Unit in London, Ontario. This is a large-scale application, responsible for processing and storing over 300,000 data points on a daily basis. I was a core member of the development team, and as such, was responsible for a majority of the back-end data processing, search functionality logic, dynamically-generated front-end presentation logic, and many other features of this application. I was also solely responsible for the maintenance and upgrades to the application since it’s initial release. Any features discussed here were my sole or shared responsibility. Below is a video of my first conference presentation at Full Stack Toronto 2015. Although I am used to speaking in meetings or in a full room of college students, this was my first time presenting to other industry professionals on such a level. Overall, I was happy with my presentation, and I’ve been invited back to speak at the 2016 event this October.